Approaching the site I was surprised to see snow on the ground!The 6m gear was assembled and Noel was a good signal on NBFM, although there was deep QSB. Transmitting 50 W of DVBS to Noel he could not quite get a picture decode. As I was using my Portsdown 2019 system, which is Limesdr mini based I had the option of running DVBS-2 transmissions, which supposedly gives the system an extra 2 dB capability. Switching to that mode allowed Noel to get a decode. Noel then transmitted around 10 W of DVBS-2 back to me. The minitune receiver could not quite get a picture , but I left it running while on a long meander around the site trying to find cellular coverage, and when I came back had captured his test card. 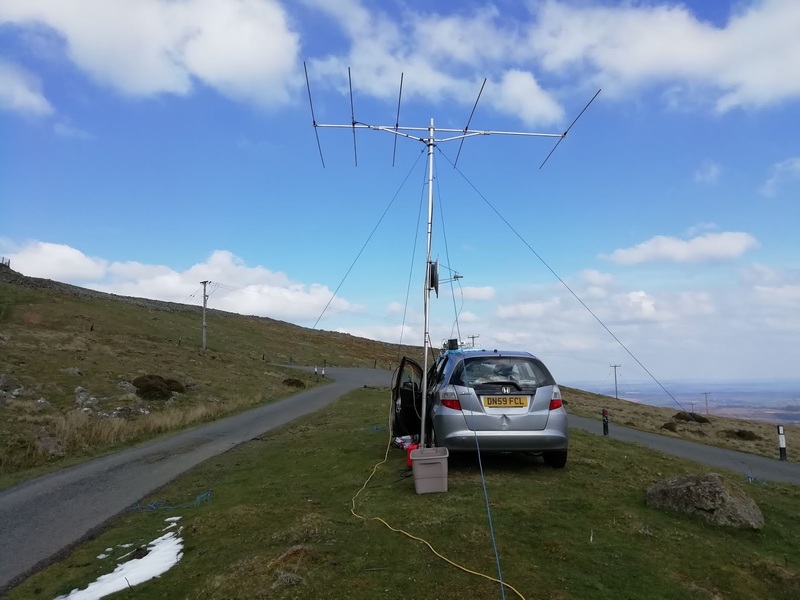 Two way qso of 140 km completed for a new UK record. I then assembled the 5665 MHz equipment, with its 2' dish and FPV modules with an 8W Fujitsu amp. The FPV Transmit module needed a 20 dB attenuator to avoid overdriving the Amplifier. Talkback was on 6m FM. Noel couldnt see my signal, and I couldnt see his 3 W, with the exception of a 15 second period, assumed to be aircraft scatter where his signal was identified. Partial success at least, perhaps confirming the predictions were correct.